By September, the chicks are flying. 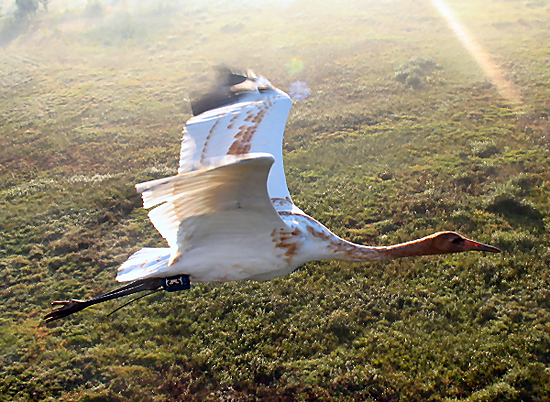 They practice flying with their parents, whether with real adult cranes or, from 2001 to 2015, with tiny aircraft and Operation Migration pilots wearing white costumes to hide their human forms. The parents are teaching a whole new set of skills that include flying, watching for danger from the air, and finding safe places to land. Days grow shorter as autumn arrives, and the cranes are getting restless. Parents want to move south after they’re done molting, but those with babies don’t want to rush them, so that may keep families behind on the nesting grounds for now.